Formula One driver Valtteri Bottas finished fifth on the Arctic Rally, the opening round of the Finnish rally championship, driving a Ford Fiesta WRC in a special class. The event was dominated by Emil Lindholm in a Volkswagen Polo GTI R5 some 24 years after his father Sebastian won the same event. 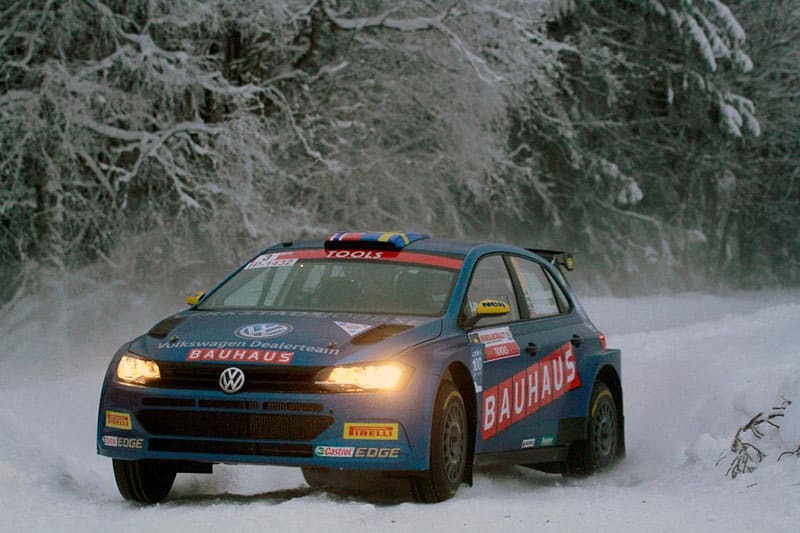 Long stages were run in temperatures of down to minus 30 degrees. Lindholm’s problem was a broken power steering pump. Skoda Fabia R5s driven by Teemu Asunmaa, Juha Salo and Henrik Pietarinen finished next. Next round of the Finnish championship, the O.K. Auto-rally in Kouvola, coincides with the WRC Swedish Rally. Announced at Monte Carlo is that the part-time Hyundai team driver, Dani Sordo, is to contest the Portuguese championship Rali Serras de Fafe on 22-23 February, his first event of the year. He will be in a Hyundai Motorsport-entered Hyundai i20 R5, as preparation for Rally Guanajuato Mexico (7-10 March). World rallycross champion Johan Kristoffersson (pictured above) won the Mekonomen Bergslag Rally, opening round of the Swedish Rally Championship in a VW Dealer Team Sweden Polo GTI R5, co-driven by Stig Rune Skjærmoen, formerly co-driver of Pontus Tidemand and Ole Christian Veiby. Patrik Flodin in a Skoda Fabia R5 won the opening two stages, but then chased in vain to take the lead back, finishing 10.1 seconds behind Kristoffersson. Reigning champion Martin Berglund, Skoda Fabia R5, finished third, 39 seconds behind the winner. Polish driver Piotr Fetela won the Sno*Drift Rally, opening round of the American ARA series and run at Atlanta, Michigan. He was in a Ford Fiesta Proto, finishing nearly four minutes ahead of Cameron Steely’s Subaru Impreza STI. Reported at Monte Carlo was a curious comment by Tommi Makinen that the rally was “unfair”, because the organisers did not cancel stages four and five, having already been forced to cancel stage three because of spectator problems. These three stages, run in widely varying weather conditions, were run in a loop of three stages between service points, where tyre choices were made considering the anticipated overall consequences of the stages. Makinen himself won the event as a driver four times, 1999 to 2002. His Toyota team had finished the event second for the two previous years, but this year only finished third. Although he was the fastest driver on the event, his driver Ott Tanak lost the chance of victory this year not because of the stage cancellation on the Friday, but because he punctured later that day. Star of Monte Carlo this year has to be Fiesta R5 driver, 23 year old Adrien Fourmaux. He is the current French Junior champion and finished fourth top R5 driver and tenth overall. This was his first event outside the French national championships and only his second event in a four wheel drive car. His car was run by M-Sport Poland.